Sometimes you read the blurb on a moisturiser and expect unicorns and rainbows to come leaping out of the jar when you lift the lid. I like my facial cream to hydrate my skin and contain good honest ingredients, I don't need it to promise me the world and then some. This is why I gravitate towards brands with good ethics and simple packaging. PHB's products have been a winner for me for a while now. 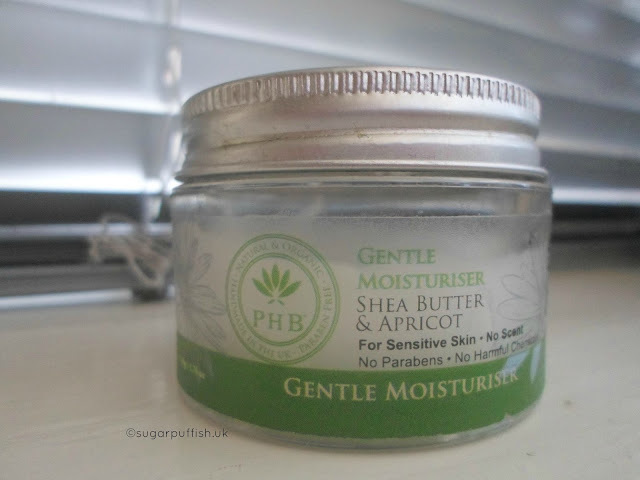 I have been using daily (morning & evenings) PHB's Gentle Moisturiser with Shea Butter and Apricot. This cream won a Bronze Award for the Free From Skincare Awards 2015. As the name suggest, this moisturiser is fragrance free and ideal for sensitive skin. It contains a good selection of ingredients such as aloe, apricot kernel oil and shea butter which offer great benefits to delicate skin. The Gentle Moisturiser has a gel like texture which is likely due to the aloe vera content (it's top of the ingredient list). I find I only need the smallest amount but if I am a little over zealous, it's not the end of the world, it just takes a bit longer to absorb. My skin is always left feeling soft and smooth with zero sign of irritation or flare up. PHB have five moisturisers in their range (including this one) so there is a product for every skin type. I have sampled the Anti-aging Moisturiser with Monoï Oil and Gardenia and that too is a delightful product with a desert island fragrance. I don't think you can grumble at the prices either £16.95 - £18.95 for a 50ml jar. The brand is suitable for Vegans and free from those "undesirable" ingredients I am always banging on about! You can buy direct from their website (PHB Ethical Beauty) and I have also spotted in Holland & Barrett. As you can tell this is a winner for me and I am confident to recommend to others. Let me know if you tried any products from PHB Ethical Beauty. I'd love to know which are your favourite.